To develop environmentally friendly coating materials with good workability, a low-viscosity polyurethane acrylate (LPUA) was newly synthesized using cycloaliphatic isocyanate, 2-hydroxypropyl acrylate and caprolactone hydroxyl acrylate. Low-viscosity UV-curable dendritic polyurethane acrylate coatings (LPUA-DAs) were then prepared by adding different amounts of dendritic acrylates to LPUA. The viscosity of the resulting products, curing behavior, mechanical and thermal stability, hardness, and flexibility of the UV-cured films were examined. The mechanical properties and the glass transition temperature increased with increasing content of dendritic acrylates but the viscosity decreased. 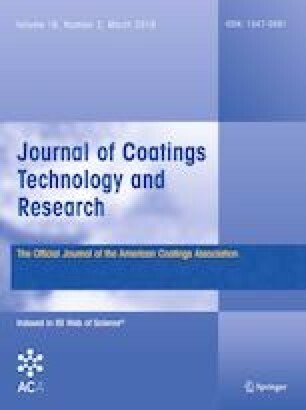 The optimal properties of the coating materials were observed when 10% of dendritic acrylate was used. This work was supported by the Industry Core Technology Development Project of Research Funds of Ministry of Trade, Industry and Energy (No. 10070142). CSH also thankful for the financial support by the National Research Foundation of Korea (NRF) Grant funded by the Ministry of Science and ICT, Korea (NRF-2017R1A2B3012961; Brain Korea 21 Plus Program (21A2013800002)).